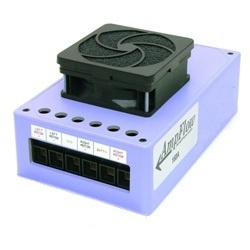 The AmpFlow Dual Motor Speed Controllers operate at 6 to 42 Volts and can handle 160 Amps per channel. They feature adjustable braking, acceleration, and current limiting. A BEC (Battery Eliminator Circuit) provides a 5V power output for use with radio control receivers or other devices. Two mixing options are available. Each joystick can operate one channel independently, or a single joystick can operate both channels for tank-like steering. Over-current and over-heat control logic prevents meltdowns and provides the maximum current even under stalled conditions. The maximum current limit is adjustable. The 160A controller measures 7.5" L x 4.3" W x 2.2" H. Weight: 1.4 lb. Note: This controller has been updated with a metal case rather than the plastic case in the above picture. We recommend using the IFI 48V motor speed controller with our 48-volt motors. Visit this page for more details. This speed adjuster plugs into the radio control inputs of the motor controllers. It is a quick and easy way to send control signals to the motor controllers without the need for an RC transmitter or receiver. Turn the knob to control the motors from full forward to full reverse or anywhere in between. 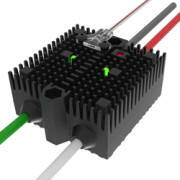 One unit can control both channels of the speed controller by sending the same signal to both channels. Two units are required to have independent control of speed and direction on both channels.